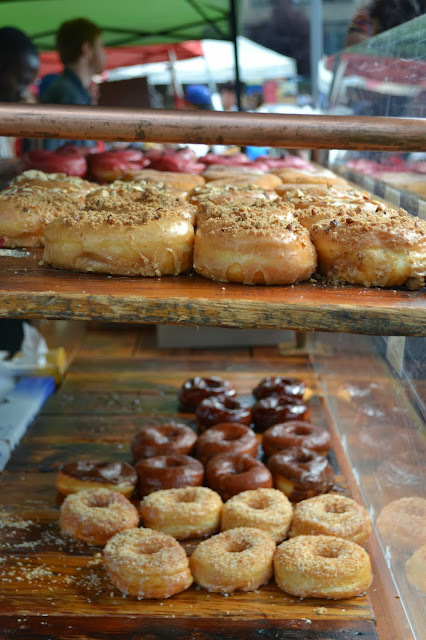 On a Saturday afternoon flea market visit, I ran into these delicious doughnuts. They actually caught my attention because of having a "dulce de leche" flavor, which I am absolutely a big fan of. Unfortunately, I missed out to buy one early enough, and when I was leaving the flea market, there were no more left. But the disappointment did not last very long, when they told me that there was also a shop nearby where I still could buy the doughnuts.. I went there, bought the hibiscus one (dulce de leche had been sold out ;) and was endlessly happy. Type of place: It's just a small shop, selling many many sorts of nice doughnuts for about $2, but also other pastries and coffee. Food: The frosting on my doughnut was amazing and the dough is super fluffy, making it a dream for everyone who loves pastry. Other tastes were two types of chocolate, passion fruit, dulche de leche, hibiscus, cinnamon sugar, lemon poppy seed... it tastes home made and you will recognize the difference between these and other "cheap" doughnuts. Atmosphere: Since it is rater a shop to have your doughnut for take away, it is a bit hectic place, but still with nice interior and stylish lamps. What I liked about it was the view into the kitchen so you could see how they prepared all the sweet things. Price: With about $2 for a doughnut the price you pay is slightly higher than for regular doughnuts, but quality is way better and it tastes just amazing ;) ! !